Everyone’s favorite bad girl Cyndi Lauper is known for her anthem “Girls Just Want to Have Fun,” but in Tel Aviv on Friday she took some time to get serious for her signature cause, the issue of gay rights. Lauper, a longtime gay rights activist, who is in the Holy Land for a much-anticipated debut concert Saturday night at the Nokia Stadium in Tel Aviv, paid a visit to the city’s LGBT Community Center at Gan Meir Park. There, she met with some of the city’s leading queer activists, including representatives from the religious LGBT community; Hoshen, the education and information center of the community; and IGY, the nation’s Gay youth organization. She was on hand, she said, to use her celebrity status to bring attention to the organizations’ causes, but more importantly, she was there to listen. 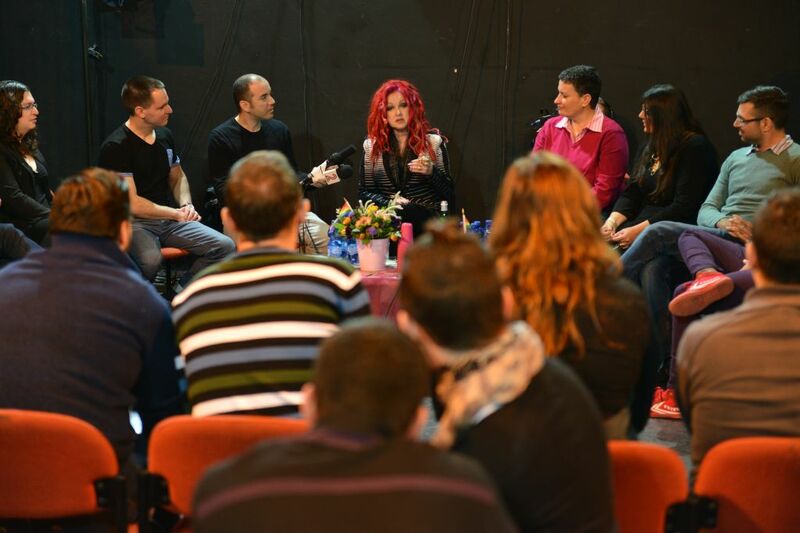 Zuharit Shorek, who first organized the religious gay community in Tel Aviv, kicked off the event by explaining that the city’s LGBT community encourages its members to share their personal stories. And she shared her own story, of growing up Orthodox, and being all but disowned by her parents after coming out at the age of 29. Lauper, who in her trademark irreverent way was sporting tomato-pink hair and studded leather trousers, listened earnestly and at one point cut Shorek off to tell her that her Orthodox parents were the ones losing out. The conversation was then moderated by Shay Deutsch, chairman of the LGBT Association, who took questions from Lauper about the role of politicians in Israel’s gay-rights struggle and the relationship between Tel Aviv’s gay community and that of other cities. Deutsch said that the community had seen progress, with more gay and lesbian candidates running for political office than ever before, and Lauper urged that the political effort had to continue because gay politicians would be the key to securing gay rights. Lauper has been an outspoken advocate for gay rights throughout her career, which began in the early 1980s. Professionally, she’s had several boundary-smashing successes. She released nine studio albums and has not only Grammy Awards but also Tonys and Emmys in her collection, and her 2011 book was a New York Times bestseller. Lauper bears a personal connection to gay rights — her sister is a lesbian — but she has often said that as a child coming of age during the civil rights movement, equal rights for all humans seemed to her like a simple issue of fairness. In 2007 and 2008 Lauper launched her “True Colors” tour, a series of concerts that raised awareness about gay, lesbian, transgender and bisexual issues across the United States, and she is the founder of the True Colors Fund, which focuses on gay at-risk youth with an emphasis on gay homeless youth. On Friday, she stopped the conversation for a moment to ask her manager to collect business cards from the activists present, so that the Tel Aviv LGBT Community Center could be cross-promoted on her website and resources could be shared.